Click HERE for the Monday Challenge and Prize! Today it is design team day over at the Celebrate the Occasion Challenge blog! The challenge is to make a card for a someone moving into a new house. Head on over to join in the fun! A winner will be selected and entered into CTO's monthly drawing. This was such an easy card to make! It was cut from the Wild Cards cartridge at 5.09w by 5.16h with all of its layers. The stamped sentiment (Congratulations!) is from one of my new stamp sets coming out soon!! Can't wait to show them to you! I hand cut the chimney piece - just a rectangle to hide my patterned paper. The roof already has these great lines cut to look like shingles so I inked them with Walnut ink to make them more obvious. I used Tea Dye ink (ranger distress inks) to ink all of the lighter pieces. I also cut the tree out twice and cut apart and pieced together so I could have brown and green. I used a white gel pen to add lots of dots and faux stitching. I think it adds a lot. 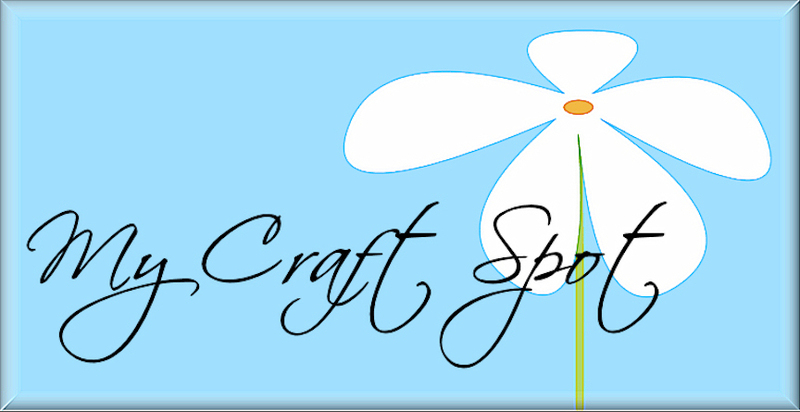 My Craft Spot Monday Challenge #1 and Winner! My Craft Spot Monday Challenge! Every Monday I will put together a project with a challenge. 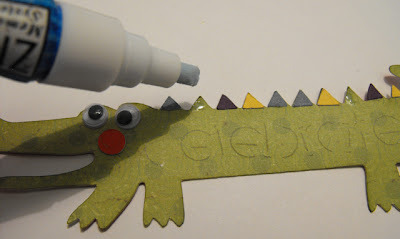 Play along to win some fun products from My Craft Spot and other goodies! Yay! Today's Challenge: Tie a Bow! Make a card, scrapbook layout, or any other crafty project that pops into your head, with a tied bow somewhere on your project. 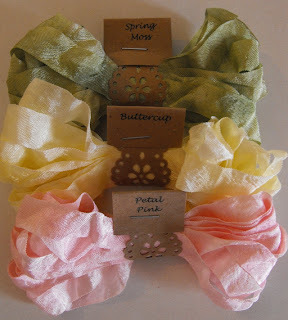 You can use ribbon or twine or anything else that you can tie a bow with. Sneak Peek: The stamped sentiment comes from one of the new stamp sets coming to My Craft Spot!! This is what you could win - Springtime Crinkle Ribbon! Winner (picked randomly) will be announced next Monday with the new Monday challenge. I can't wait to be inspired by all of your projects! We have a Winner for last Monday's Giveaway!! I now subscribe via email...and I became a follower! Sorry the colors are so washed out! I am missing the sunshine this week!! I Cut the base from the Just Because Cards cartridge at 4.12w x 5.91 h (This cut is Shift/Lock row 3 number 2) - I love this cut - so pretty! I think I will have to find some more ways to use this. I cut a rectangle from blue patterned paper 3 x 4 4/8 inches, adhered it to the base, and tied a bow looping the ribbon (Aqua mist) through as shown in the picture below. The butterfly was cut from the Home Decor cartridge at 4.03w by 2.62h. I used Pop it squares on the butterfly to hold on the antenae (Spring Green Bakers Twine - knotted) and on the sentiment to give them dimension. I cut a 6.18w by 4.42h rectangle using the George cartridge and folded it in half for the actual card. The Stamped sentiment comes from one of my new stamp sets coming out in a week or two!! This picture (below) is the closest to the real colors of this card. It has been cloudy all week! Click HERE for this weeks giveaway! Click HERE to see the Prima flowers video highlighted in the Cricut Chirp! I chose bright colored card stock from Paper Crate for this fun card. I designed the banners on my Gypsy and then discovered that the Country Life cartridge sitting on my shelf had a banner just like this! Please tell me I am not the only one who does this sort of thing! LOL! Anyway, if you use the Country Life cartridge, this would be cut at about 1.25 inches. I used a white gel pen to add faux stitching and dots on the alligator. The Alligator is from the Birthday Bash cartridge and was cut at 5.32w by 1.59h on my Gypsy. I would guess that 1.5 on the cricut would be about the same. I ran all of the tiny letters through my Xyron sticker machine, then added googly eyes. I used dimensional squares to hold the bakers twine in place and then stuck it to my card. I entered this in the Frosted Designs Fabulous Friday Challenge. It's all about banners! Highlighted in the Cricut Chirp! My "Making Tiny 'Prima' flowers" video was highlighed in the Cricut Chirp! Hi everyone! Thanks for all of the sweet comments you leave and a big "THANK YOU!" to all of My Craft Spot customers - over 100 of you! I really appreciate it! Soooo . . . I thought I would do a giveaway to say thank you and to announce the new weekly challenge at My Craft Spot (starting next Monday - the 28th)! There will be a fun new challenge each Monday with a prize! Yay! Here's what you can win this week! 5 spools of traditional bakers twine! 2. Subscribe to this blog via email and leave a comment saying that you did. 3. Grab my new button for your blog and leave another comment saying that you did that. How easy is that?!?! Of course, I don't mind if you become a follower if you aren't already! 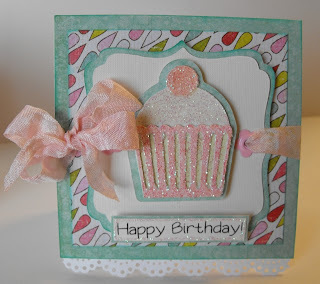 I learned how to make these fun cards from Sheila over at the Sassy Lady Blog. (Thanks Sheila!) Click HERE to see her tutorial. Click HERE to see this weeks giveaway!! This is what it looks like open (above) and closed (below) I used a cuttlebug embossing folder for the background. I used Cherry Red Bakers Twine and looped it around twice before I tied my bow. I think it adds a nice finishing touch! I welded two 4 inch squares (with rounded corners) from the George cartridge together and then added a smaller square (3.41h) in the center of the right side to make a window. I welded the shadow for the Sundae (3.38 h) and the words 'happy birthday' (1.3 h) to the frame. In order to get the weld to cut correctly, I had to move the card base off and then move it back over the top of the sundae and words. I think you have to add the frame last if you want it to cut out correctly. The sundae (Just Because Cards cartridge) was cut at 3.38 high with all of its accessories and I cut the words 'happy birthday' (Create a Critter cartridge) and its layer out again at 1.30 high. For the ice cream, I covered the whole surface with glossy accents and then sprinkled fine white glitter all over. Tip: Dry flat with this technique as the glossy accents can run and it takes about 2 hours to dry. I used stickles and studio G glitter glue to color in the letters , cherry, leafs and to outline the frame. I spent today re-doing my blog! What do you think? My computer and I don't always get along, but the new blogger template designer is super easy! Exciting new things are coming to My Craft Spot! Monday I will have some Blog Candy to give away, so be sure to check back. I am going to start a Monday challenge with a prize each week starting March 28th. I also have some new products coming in a few weeks! Yay! Here is my new button if you would like it! Good morning my crafty friends! Today it is design team day over at the Celebrate the Occasion Challenge blog! The challenge is to make a card for a new pet or new baby. Head on over to join in the fun! A winner will be selected and entered into CTO's monthly drawing. March's prize will be the Rock Princess cricut cartridge!! This card is from the same sketch as one I did a few days ago. Both cards even have a Chick! I thought the scalloped circle shape was so fun that I made a few cards like this. First, I used a circle the same size as the white inner circle that the grass is attached to as a template. Next, I welded the grass border from the Paper Doll Dress ups cartridge (1 inch) to a circle that had been stretched so that the bottom was the same as the circle you are using for a template, but didn't stick up past the grass blades. ** There may be an easier way. I just couldn't get the grass to weld to the bottom part of the circle and then cut out at the top. If you have an easier way, let me know!! Click HERE to see my first card from this sketch and for directions telling how to make the base card. The Crinkle Ribbon is a color and technique that I have been experimenting with and isn't available yet. The flower I made using the Mother's Day bouquet cart and my Gypsy (love my Gypsy!!!) Click HERE to see a video showing how I made this flower.